For most people the mention of authentic craft cider will probably lead to visions of Somerset and the West Country, so our project’s concentration on Welsh producers of craft cider posed some interesting questions. Contrary to some initial expectations, Emma-Jayne Abbots’s research has found that the Welsh-ness of the product is not that important to how craft producers view their cider as authentic. Rather, the emphasis has been on techniques and scales of production, on non-synthetic ingredients, on the time and effort put into making the cider, and above all the character and integrity of the producer. So, while a food or drink might be quite strongly associated with a particular regional identity, this doesn’t mean it can’t carry strong symbolic meanings of authenticity outside of that region. This is even more evident when we consider cider production in far-flung reaches of the globe. I have recently been reading Alcohol in Latin America: A Social and Cultural History (University of Arizona Press, 2014), edited by Gretchen Pierce and Áurea Toxqui, and its final chapter by Anton Daughters is a fascinating discussion of cider and local solidarity in a rural part of southern Chile, just to the north of Patagonia. Known as chicha de manzana in this region, cider has been produced there since at least the 17th century, after the Spanish colonists introduced apples to the local agriculture. Daughters’s chapter argues that cider production became embedded in reciprocal labour relationships that characterised the Indigenous societies of the Chiloé region and continued to operate as they intermarried with Spanish colonists during the 16th and 17th centuries. In these reciprocal arrangements, households, each typically with their own small-holding, would offer their assistance to their neighbours for agricultural and other tasks that were beyond the capability of individual families to achieve. One of these tasks was the annual collection of the apple harvest and the pressing of the apples, known as the maja de manzana. These were organised as festive occasions, with the helping families being provided with food and drinks by the host family. Interestingly, Daughters outlines how the collective, reciprocal work arrangements are now relatively uncommon because of the inroads of neoliberal economic changes meaning that not many families rely solely on small-holdings any longer. However, the maja de manzana does continue and although this is sometimes more a ceremonial than a practical affair—organised, for instance, by town councils instead of families—it remains an important expression of community solidarity and identity. It is striking how the cider pressing is the one communal task—of many—that has been singled out for preservation in this way. This raises the question once again, which I have pondered previously, of the similarities and differences between foods in general and alcoholic drinks in particular in discussions of their authenticity and symbolic value. Perhaps the intoxicating nature of alcohol drinks gives them special importance to occasions defined by communal sociability and festivity like the maja de manzana. 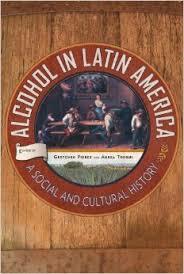 I have written a review of Alcohol in Latin America, which will be published by the journal Food and History shortly. 1. Literally, apple chicha. Chicha most commonly refers to a beer made from maize (corn) and is drunk in several countries in South America, including Bolivia, Chile, Peru and Columbia. As a term it is also used more generally to refer to several different kinds of alcoholic drink.